From April to September, a hush descends over Torres del Paine. The summer crowds disperse and ambitious adventurers who aren't afraid of a bit of snow have the park almost to themselves. Days are shorter, temperatures lower and some trails are snow-bound, but as the wind drops and skies tend to be clearer, there are some beautiful snowscapes to be explored. It doesn't get more wild and rugged than Torres del Paine in winter. Don your hat and gloves and trek the famous trails when they're covered in snow. Without the crowds of the high season, you can really take your time to enjoy the snowscapes, before pushing on further into the wilderness. Can I still hike in winter? The W Trek trails are passable in winter, although more of a challenge to hike because of the snow. The hiking is not more technical, but you will have to be comfortable trekking in cold weather. As not all the refugios are open, you'll be doing the W Trek as day hikes, and some days will start with a transfer to the trailhead. Flexibility is key, it is not unheard of for weather conditions to cause changes to your itinerary. The Full Circuit and other off-the-beaten-track trails aren't used in winter, and there is no service in the refugios in these more remote areas. What about other adventure sports? You can still kayak, horseback ride and mountain bike your way around a snowy Torres del Paine, but excursions are limited. There are no multi-day trips, but half and full day trips are available in certain areas of the park. Only a few of the hotels and lodges remain open in the low season, so it's worth asking our specialists where is best to base yourself. A few of the refugios remain open but with reduced services. Beds and showers will be available, but heating cannot always be guaranteed. Most of our trips run with a minimum of two travellers, so if you are travelling on your own we will do our best to align your travel dates with other confirmed groups that you can join. Flexibility in your travel dates will increase your chances of finding a trip, and you may need to wait a little longer to secure your space in order to allow time for more groups to confirm their departures. Is travelling to and from the park harder in winter? Transfers from Puerto Natales to Torres del Paine still run in winter, however getting from Puerto Natales to El Calafate is less straightforward in winter. There is no direct bus that operates every day, and buses tend to set off later. If you're looking to combine your time in Torres del Paine with Los Glaciares, ask our specialists about the best way to get between the two. The Torres del Paine Winter W-trek is a unique way to experience the National Park. Torres del Paine is a beautiful place with varied and breathtaking landscapes and I was lucky to get some amazing pictures. We saw only a few other groups during our trek which was nice as the refugios were not busy and we were able to really appreciate the views. Hiking up the Torres in a driving snow was pretty awesome; on top of the fact that the winter weather limited the number of people on the trail, we only saw one other hiker. Patagonia was amazing! We were wary of visiting in the middle of winter, but we are so glad that we avoided the crowds and could enjoy the peacefulness of the area. The trek was unbelievable!!! The best hike I've done. We had a world class guide who was very informative and took care to make sure everyone was OK and spent time to really answer people’s questions. We had a very good time, beautiful park, nature absolutely great, transport there and back, all very well organised. We'd like to come back next year! I loved my time in the park! The itinerary was great, Swoop was great, thanks again for helping me have such an amazing experience in Patagonia. Each day brought a different hike and ever changing views to be in awe of. Thanks again for all of your help, Our family had an absolutely outstanding trip! What can I do in winter? Thick snow will make the hiking harder, although the effort is more than worth it for the photo opportunities. 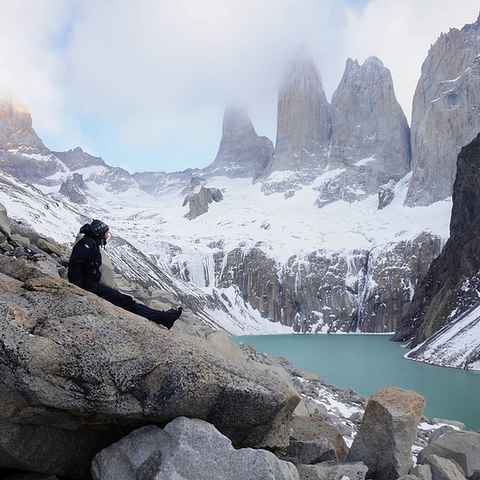 You can still hike the most famous trails in Torres del Paine in winter. The Base of the Towers, French Valley and Grey Peninsula routes are all open, however as the refugios between them are not, some days will start with a transfer from your hotel to the trailhead. The Full Circuit and more off-the-beaten-track routes are not used in winter. Whilst on the routes you'll be treated to quiet and secluded hiking trails, stunning light conditions for photography and good opportunities for spotting wildlife. These hikes are not more technical in winter, but you will need to be prepared for the weather, use our winter kit list can help make sure you have everything you need. Horse riding, kayaking and mountain biking are still available in the park in winter, just limited to certain areas. You don't need to be more experienced or have any technical knowledge, just make sure you remember your warm clothing! Horse ride through unexplored valleys and along the shore of the Serrano River to reach the Tyndall Glacier lookout point where your horse can take a rest as you take in views of the Southern Ice Cap stretching into the distance. Kayak the turquoise water of Lago Grey with its floating icebergs so close you can run your fingers over their surface. Sculpted by wind and sunshine, no two are the same. The Grey River is also open for kayaking, a river that twists and turns through steep canyons, with stunning views of the Paine Massif. Fat bikes are a must for biking in winter. Ride to Laguna Amarga, past the dazzling Blue Lagoon and Cascada Paine waterfall, two gems of the national park. With the park so quiet, the only sound will be the crunch of snow under your tyres and the calls of ducks, coots, swans and woodpeckers that still thrive here in the cold weather. This is one of the most sought-after places in the world to watch and photograph wild pumas. With a steady supply of guanacos to eat, and protection from hunting, their numbers are uncommonly high in Torres del Paine. Although you can see pumas all year round, it's easier to spot their beautiful golden colours against the white snow in winter, and as they descend from the mountains to search for food you're in with good chances of sightings. Services in and around the park are limited in winter, so we work with hand-picked local operators to design personalised winter itineraries. You can make the most of your time in the park and hike with confidence, knowing that you're well looked after and won't get caught out in bad weather. There are very few Trekkers out in the winter so if you’re planning on going but not a confident camper/trekker then definitely book in a guide with Swoop. We were very lucky with weather, but I probably didn't understand the extent how weather conditions could impact this trek so much. So tip would be, be prepared for anything! Only a few hotels and refugios are open, so ask our specialists about the best place to base your trip. The central location of Hotel Grey makes it a good choice as a base for the W Trek, whereas Hotel Explora and Hosteria Pehoé are a little further south and will require increased travel times to the trailheads, but offer one-of-a-kind views of the entire Paine Massif.